A combat event is a contest during which eliminating heats are followed by a final in which two competitors with their model aircraft fly in the same circle at the same moment for a predetermined time, the object being to cut a streamer attached on the longitudinal centre line of the opponent's model aircraft, points being awarded for each cut taken. The longitudinal centre line shall be defined as the axis of the propeller in case of a single engine model aircraft and the axis of symmetry in the case of multi-engine model aircraft. To avoid the catching of the opponent’s lines the protruding parts of the helmet must be covered. No communication using electronic devices is allowed between the pilot and mechanics/persons outside the flying circle. For World and Continental Championships, the mechanics, a maximum of six other than team members or the team manager (or assistant team manager), must be registered for no more than one national team, from the beginning of the competition throughout to the end. The minimum total volume of the exhaust system shall be 12,5 cm3. In the case of two exhausts, each silencer shall have a minimum volume of 6 cm3. The maximum total length of the exhaust system from exhaust port(s) of the cylinder to and including outlet(s) is 15 cm. One pressure tap directly connected to the fuel tank, of maximum diameter 2 mm, is allowed. No other openings or vents are allowed. Any interconnecting chamber between the air intake and the induction port of the motor shall have a maximum volume of 1,75 cm3. This clearly prohibits sub-piston induction for supplementary air intake. The model aircraft shall be equipped with a device specially designed to retain the streamer which shall be fitted on the longitudinal centre line and sufficiently strong so that the streamer shall not become detached under normal flying conditions. Standard fuel shall be supplied by the organisers to the following formula: 10% nitromethane, 20% castor oil lubricant (first pressing) and 70% methanol. Fuel shall be mixed by volume. Each model aircraft must be equipped with an engine shut-off device that stops the engine automatically if a fly-away occurs. The shut-off can be inactive at take-off, as long as it becomes active before combat starts. Once active, the device must remain functional for the entire time the model aircraft remains airborn. The device may only be used to stop the engine(s). Note: Rule 1.3.2. Section 4C, Sporting Code Volume ABR, does not apply to engine-stop devices in class F2D as the device may be electronic and controlled via the lines or wireless. Rule B.3.1.a Section 4B, Sporting Code Volume ABR, does not apply to class F2D. Each set of lines must be checked for length and diameter. The line length is measured from the inboard face of the grip of control handle to the longitudinal centre line of the model aircraft. Engines, control lines and handles may not be replaced or interchanged during the combat period. The streamer shall consist of double weight crepe paper (80 g/m2) or any replacement of equivalent strength, not less than 2,25 m or more than 3 m long and 3 +/ 0,5 cm wide, fixed to a sisal (or any replacement of equivalent strength) string of 3,25 m minimum length.>BR> All streamers must be of the same length. There shall be a clearly visible ink mark 2,5 m from the junction of the string and streamer. The attachment end of the streamer shall be reinforced on either side by tape approximately 2 cm wide affixed diagonally to the length of the streamer with one at right angles to the other and extending for a maximum of 5 cm. An additional fibre/fabric reinforced tape 2 cm wide is affixed across the streamer (see detail below). The colour of the streamer must be different for the two competitors in the heat. Each pilot/pit crew shall be issued with a streamer before the start of the heat by the judge assigned to that competitor. A second streamer will be available from the judges when needed. During the starting period the launching positions must be separated by at least a quarter of a lap The first named competitor in the draw shall have the choice of streamer colour and the other the choice of starting position. Only the streamer/string may be moved around the circle by the mechanics/pilot. Models in the pitting area may not be moved, other than to maintain a safe distance of approximately 5 metres from the opponent’s mechanics. Unless otherwise directed by the judges, it is the rearmost team’s responsibility to move back before pitting. Under conditions of heavy wind, the Judges can allow models with a non-running engine to be moved to a safer starting position. When moving around the circle the mechanics/pilots must be on the outside of the pitting circle. Within the pitting area and flight circle, mechanics may only move radially inward and outward. The Circle Marshal will monitor the conduct of both pilots, and shall issue a yellow card warning to any pilot who uses a rough or unsafe flying style, causes line tangles, or displays unsportsmanlike behavior. Each yellow card issued (a maximum of three for each pilot, per competition) shall be officialy recorded and retained for the remainder of the competition. Initial and subsequent offences during a competition are to be penalized in accordance with 4.4.12.A and 4.4.12.C, respectively. If the first yellow card incident is considered severe, the pilot shall also be disqualified for the offence. Yellow cards are cumulative throughout the competition. 1st yellow card = 40 point penalty or disqualification from the heat for a more serious offence. The Circle Marshal shall signal both pilots to fly level and anti-clockwise and to cease combat when both streamer strings have been cut. If one pilot has only the string remaining he may request the circle marshal instruct both pilots to fly level and anti-clockwise and to cease combat. if the heat has to be terminated due to disqualification of one or both competitors or for any other reason. Scoring shall start at the signal to launch and continue during the 4-minute heat. 100 points shall be awarded for each distinct cut off the opponent's streamer. There is a cut each time the model aircraft, propeller or lines fly through the opponent's streamer resulting in particle(s) becoming detached from the streamer. A cut that contains only string does not count. Two points shall be awarded for each second that a model aircraft is airborne during the heat. In the case of a model aircraft fly-away the watches should be stopped from the moment of the fly-away. Each penalty point given (See 4.4.12) shall be subtracted from the competitor’s score. In the event of a tie score in any heat, that heat shall be re-flown. A heat is considered a tie if the score difference is 10 points or less. In the event of a line tangle resulting in the control line(s) breaking and only one model aircraft being grounded, making it impossible to clear the line tangle. If, as a result of combat, a model aircraft cuts its own streamer/string or the streamer/string becomes wrapped around the model aircraft and/or the lines (unless only string remains). at the discretion of the Judges/Circle Marshal if an unfair situation occurs and none of the pilots/mechanics is be blamed. if he steps outside the pilot circle with one foot while his model aircraft is airborne. if the mechanics enter the flying circle at an oblique angle or cut across the flying circle to reach a downed model aircraft. One penalty only will be given for each offence even if more than one mechanic is involved. if the mechanic(s)/pilot do not immediately, or after a clearing a line tangle, withdraw a grounded model aircraft to the pitting area prior to servicing it. It is not allowed to service the model or remove the streamer until any line tangle is cleared. if the model aircraft is launched prior to the starting signal. if the mechanic(s)/pilot allows both engines to be running at the same time during the flight period. Brief bursts, not longer than 10 seconds to warm the engine with a prime or to clear a flood is permitted. Running the engine from the tank is not permitted. when he receives his first yellow card (Subject to 4.4.9.n). if the streamer does not cleanly unfurl upon launching the model aircraft. if the mechanic(s) damage the streamer or allow the model aircraft to cut its own streamer whilst still on the ground, and launch the model without replacing the streamer. if the string becomes detached from the model aircraft while airborne prior to the signal to start combat. if the silencer falls off during the flight or ceases to operate. In all these cases the pilot, on a signal from the Circle Marshal, must immediately land and unfurl/replace the streamer or replace the silencer. The watches should be stopped at the moment the pilot is asked to land. if he flies with a model that does not conform to 4.4.5.
if his model aircraft fails to become airborne within two minutes of the signal to launch. if he deliberately attacks the streamer of his opponent's model aircraft prior to the Circle Marshal’s signal to start combat. if he interferes with his opponent, or forces his opponent to leave the pilot circle. if, while his model is not airborne and his opponent is flying or ready to fly, he leaves any parts of his model or lines in the pilot circle without an immediate attempt to clear them. if he attacks his opponent's streamer without his own, or the remaining parts, attached to his model aircraft (Except for 4.4.9.j). if he is not present at his allotted flight time, unless he has the express permission of the Event Director. if he intentionally leaves the pilot circle, while his model aircraft is flying. if he leaves the pilot circle without informing his opponent of his intention to do so when his model aircraft is grounded for a purpose other than to pick up the lines of the reserve model aircraft or to allow his model aircraft to be serviced. if he flies in such a manner as to inhibit his opponent, or his opponent's pit crew, from clearing any line tangle. if he flies other than level in an anti-clockwise direction when only his model aircraft is airborne and there is no line tangle. Sudden or rough manoeuvres are not allowed. if he fails to clear any line tangle prior to launching his reserve model aircraft unless both he and his opponent have informed the Circle Marshal that they have agreed to continue the heat without clearing the line tangle. In this event the Circle Marshal must agree to the continuation, only doing so when he is satisfied that it is safe to continue. 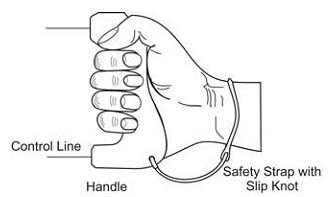 if he releases the handle and the safety strap separates from handle or wrist or he removes the safety strap, for any reason, while the model aircraft is flying. if he interferes to cause a ground hit of, or collides with, his opponent's model aircraft that clearly has no streamer left and flies level in anticlockwise direction without any manoeuvres to chase and attack. if the streamer becomes detached from the streamer retaining device during combat, but not as a result of a mid-air collision. if the model aircraft lands with no streamer string, unless the streamer retaining device is missing or bent as a result of a mid-air collision. if, during a line tangle where one or both models remain airborne, his mechanic(s) enters the flying circle. if, in the event of a flyaway, his engine shut-off device does not activate. when he receives his second or third yellow card. for any other flagrant breach of the rules. The Organiser/Judges may use a Video recording equipment to monitor the pilots and the pilot circle. At the discretion of the Judges/Circle Marshal the officially recorded video can be used as a judging tool. The contest shall be run as a knockout tournament. The competitor who obtains the highest score in points shall be the winner of each heat. A competitor shall be eliminated from the competition when he has lost two heats. Each round shall be randomly drawn (subject to 4.4.14.e)) from the competitors remaining in the competition. Previous opponents and competitors of the same nationality shall be drawn apart if possible with competitors of the same nationality to fly against each other only if there are no remaining opponents. Defending champions, not members of their national team, are considered as individuals not possessing any specific nationality. In a round with an odd number of competitors the non-flying competitor will fly twice in the following round, in the first heat and in the last heat (if the number of competitors permit it and he still is in the contest). Each competitor shall be ranked according to his number of wins, not counting fly-off heats, with the fly-off heats being used to establish second and third place as necessary. In the event of a tie for second or third place, the equal placed flyers shall take part in a fly off, during which they shall be allowed only one loss. In the event of a tie for third place after a fly-off for second place then there shall be a new fly-off for third place. A specific junior final tournament will be organised if juniors are at the same placing (tie) in the general tournament, in order to define who is first, second and third for the specific individual placing and will have no influence on the general individual placing (no change in the team classification). The competitors "win" scores, not counting fly-offs, shall be added for the participants of each nation. The team classification is established by taking the total scores, obtained in 4.4.14.g) above, of the three best scoring members of the team and adding them together. In the case of a team tie, the team with the lower sum of place numbers, given in order from the top, wins. If still equal, the best individual placing decides. Complete three-competitor teams are ranked ahead of two competitor teams which, in turn, are ranked ahead of single competitor entries. The organisers shall appoint a panel of three judges who shall be selected from a list of persons proposed by National Airsport Controls for their proficiency and experience and approved by the CIAM. The judges must have at least one language in common. At World and Continental Championships and other limited entry international competitions the judges must be of different nationalities. In open international competitions the judges must be of at least two nationalities and only two of them must be approved by CIAM. At World Cup and other Open International Competitions one of the judges and the Circle Marshal can be the same person. Three timekeepers/scorers shall be allotted to each competitor for World and Continental Championships, two for Open Internationals.